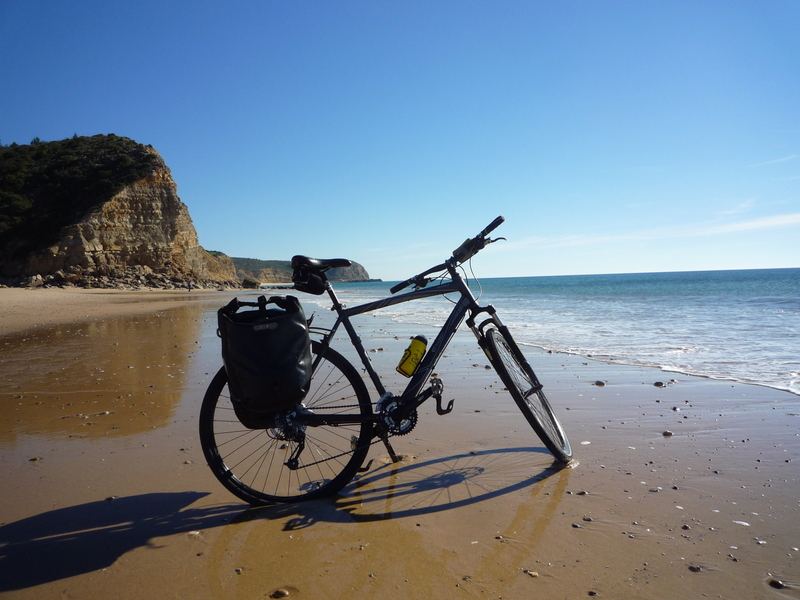 Overview: A figure-of-eight circuit going out to the north and west of Lagos, much of it on tiny country lanes through farmland and small villages – the ride also takes in a couple of stunning beaches. Distance & difficulty: Total distance around 59km (37 miles). Easy to moderate. Most of it is on very minor roads – much of it single lane. There are three sections on busy main road but in each case there is a wide shoulder to ride on and the longest bit is only 2.3km. Although not flat, there are no really big climbs on this circuit. There is a 17% gradient on one hill but the steep section is only a couple of hundred metres long at the most. Other than that the ascents and descents are all reasonably gentle – climbing up and down between sea level and a maximum of about 80m (250ft) in height. Details: The ride starts near the back of the Marina de Lagos building, which is next to the train station and just across a pedestrian bridge that connects to the riverfront in the centre of town. From here, you go up to the roundabout (next to a handy Pingo Doce supermarket) and join the N125 east. This section – which you ride at the beginning and end – can be busy but has a wide shoulder and is only 1.3km. Shortly after the aerodrome turning, take the next left and follow a minor road north and away from Lagos, before joining the N120 up to the village of Bensafrim. Just at the end of the village, turn on to a minor road heading west past various small farms, villas, orchards and fields. 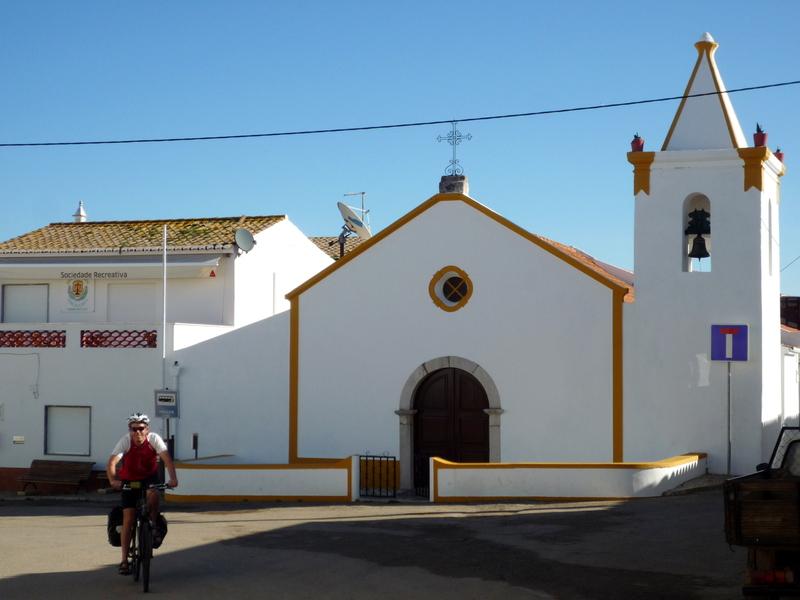 It’s a rolling ride, with forested hills to your right, all the way to the next village of Barão de São João, which has some attractive houses and narrow cobbled streets. Continue roughly south-west towards Barão de São Miguel and then on to the N125. Turn right (again using the wide shoulder) and continue until you see a brown sign on the left to ‘Boca do Rio’ beach. Head south here and follow the valley down towards the sea. The main route turns left as you come towards the end of the valley but you need to go straight on (and then return) if you want to get to the beach itself, which is well worth the effort. There’s a nasty hill (with the 17% incline) as you leave Boca do Rio and head east for Burgau but the slope levels off quite quickly – and the views from the bend above the beach are beautiful. 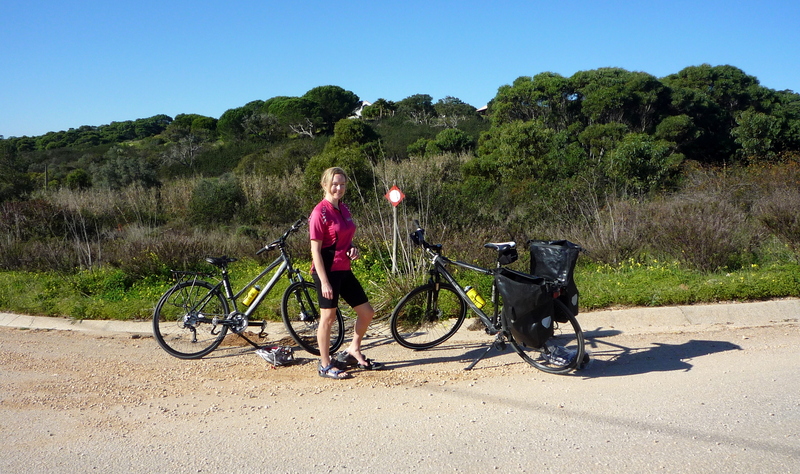 Cycling back east towards Burgau there are a couple of detours to the right – to a ruined fort perched on some crumbling cliffs and another wild and undeveloped beach. Burgau itself is quite touristy but very pretty and isn’t too bad out of season. The village also overlooks another wonderful beach. From Burgau, head north and then, as you leave the village, take a tiny turning to the right (unsignposted) towards Almadena. After riding through more countryside, a service road takes you parallel with the N125 for a short way as you approach the village. You then cross the main road and head up a one-way system through some tiny little streets before climbing back into open countryside. There are some stunning views from up on the top. Head back to Barão de São João and then take the road signposted ‘Lagos’. This takes you on a rolling ride back towards the N120 where you do a left and immediate right turn. Another narrow lane then zig-zags through some fields before taking you back to a village called Caldeiroa, which you rode through at the start. Stopping to change into sandals – 10.30am in January! You need to retrace your route from here. Be warned though: as you come into Lagos, if you follow the N125 you’re forced to go across the river on a busy section of dual carriageway, go round a roundabout and come back. You need to watch the traffic but it’s easier to cross the N125 and walk over to the road back to the marina. Facilities: Lagos has everything you’ll need in the way of shops, supermarkets, cafes, accommodation etc – plus the train between here and Faro will carry bicycles. There are cafes in various villages along the way, while Burgau also offers several restaurants (some seasonal) and a mini-market. There’s also an Intermarché supermarket (plus cafe) just off the N125 before you get to Boca do Rio. We rode the circuit on bikes supplied by Cycling Rentals. For other listings – including accommodation, bike hire, weather forecasts etc – click on Directory & Links.